American McGee describes the sequel. 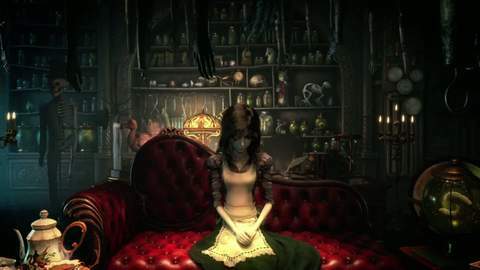 It's been 10 years since American McGee showed us his twisted interpretation of Lewis Carroll's Alice in Wonderland tale, and now, finally, we're getting a sequel. Alice: Madness Returns was announced during the summer at an EA showcase event via a spooky and frankly disturbing video. That confirmed one thing: none of the original charm has been lost. Our heroine Alice has spent 10 years confined to an asylum for the mentally disturbed. That's because her parents were torched in what she believes was a murderous arson attack. So, she's off to find out what happened, with or without the consent of the people in white coats. And she's taking her butcher's knife with her. We tracked down American McGee, who is based in Shanghai, to find out more. Eurogamer: How do you manage to get your name on the front of game boxes? Other developers don't seem to be able to. American McGee: The people at EA, back when I was an employee there, thought they needed to be able to protect the IP for the first Alice game. They went through a number of different ideas for games that didn't include my name in the title, things like Alice in Nightmare Land, stuff like that. They were trying to find a clear space that they could trademark and protect. Then, after much searching, they came back and said, "Look, American McGee's Alice is imminently protectable now and recognisable as something original. Do you mind if we call it that?" I agreed to it somewhat reluctantly the first time around. I got a fair amount of push-back from the team that was building the game. They felt like, "Hey, this is all of us in this together." I explained to them what was going on and why this was to be, and then, after a while, EA came back and said, "Oh hey, we don't have to put your name on the box after all, we can just get away with plain Alice." I went and told the team that and they were quite happy. I felt relieved. And then after a few weeks, the EA people came back and said, "Oh, we're really sorry but we have to put your name on the box after all." That happened fairly last minute. We finished the game up and they shipped it out and there it was. I guess it's a long way of saying I didn't have a lot of say in it. It certainly wasn't an idea of mine. But once it had happened, subsequent publishing partners who came along thought they might ride on the value that had been created by the success of the first Alice game. So it got reused quite a few times. It remains to be seen whether it will be attached to this new Alice; I don't think it's a foregone conclusion. Eurogamer: Why has it taken so long for us to get a sequel? The old EA was often criticised of exactly the opposite. American McGee: When we did the first Alice game it was actually the first M-rated game EA had ever done. There was some trepidation about the release of the title and the effect it would have on people's perception of the EA brand. It took them a really long time to come back around to see that after 10 years not only had it not damaged people's idea of EA as a brand, but it had in fact continued to sell and was in hindsight a really good, really solid selling game. Over a million-and-a-half units sold, which is just a single PC SKU, which they were quite surprised by. They saw that there was potential for a success in there. But another part of it was that I had gone off into the world and wound up in China and built a studio out here. There was a moment where I realised that the studio was capable of revisiting the IP in a way that I thought would honour the quality and the experience of the first game, so that's when we reached out to EA. By that time they were ready for it, we were ready for it, and it just so happened that 10 years had gone by.